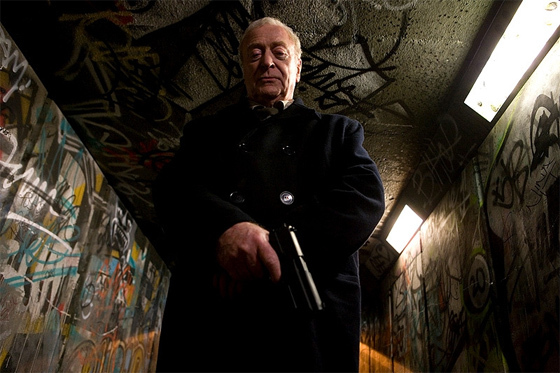 DVD Review - "Harry Brown"
Michael Caine plays an ex-Military man who finds himself fearing for his safety in his longtime London neighborhood. Drug dealers, gun runners, and all around thugs are taking over the town and before long, Caine learns that his best friend has been murdered. When the police can't make a case, Harry Brown takes matters into his own hands and wages a war of vengeance and justice on the hooligans who roam his streets. Movies like this come around at least a dozen times a year. Something tragic happens to dude, dude isn't satisfied with the law, and the law takes a backseat to dude's wrath. These can be good movies if done correctly but unfortunately it's a formula that seems to lend itself to mediocrity. "Harry Brown" is certainly mediocre (at best). The plot is poorly developed and yet moves at a snail's pace, a feat that is remarkably difficult to accomplish. We get 45 minutes into the film before Harry starts his reign of destruction and while I was certainly ready for the vigilanteism (new word for the day) to get going, all of the characters and the story line in general feel rushed. The plot twist(s) are half hearted and don't provide enough lead up to give the audience the proper perspective for what exactly is happening. Harry himself is a dull hero and one who doesn't seem to really care about the justice he's handing out. He gives off a sense of detachment and not the cold, cruel detachment that can chill your bones when done correctly. No, the detachment that Harry displays comes across as disinterest from the actor himself. It's not that Caine's performance is bad; it just doesn't set the tone the way I think it was expected to. In all honesty, the movie is just pointless. From the opening scene that doesn't really have anything to do with the movie itself to the bloody end, it's just a collection of drivel thrown together in a rather indecisive manner that ultimately left me pining for such "classics" as "Get Carter" and "Collateral Damage." Just didn't hit the mark for me.